A Nashville Predators fan has been charged after throwing a catfish onto the ice during Game 1 of the Stanley Cup Final in Pittsburgh. Jake Waddell, who was in Pittsburgh with family, said he was charged with disorderly conduct, disrupting a meeting, and possessing instruments of crime. According to Waddell, he decided to bring a catfish to the game after finding out that the Predators would face the Penguins in the Final. He bought the catfish in Nashville, then brought it up to Pittsburgh where he prepared it. "We fileted the fish, I cut half the spine out of it which is why it flopped open on the ice, and ran over it with my pickup truck," Waddell said, adding that he ran over the fish in hopes that it would flatten it out and make it easier to sneak into the game. Waddell also took steps to hide the smell of the fish, spraying it down with Old Spice body spray and soaking it in Old Spice once it was wrapped up. 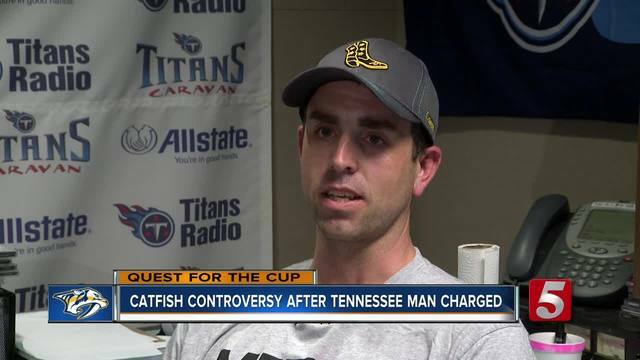 Waddell stuck the catfish in his pants between two pairs of underwear, and when he got into the game, he found two other Preds fans who were sitting close to the glass and worked it out so they would record him throwing the fish. The catfish was hurled onto the ice at 9:30 p.m. ET at PPG Paints Arena. Waddell said he was escorted from the arena amid boos from Pittsburgh fans, but he said he had a smile on his face the whole time, knowing that he was going to be kicked out, but thinking it was worth it to show his Predators pride. 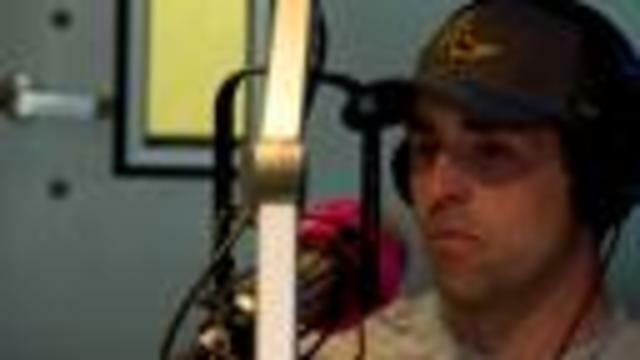 Waddell was wearing a t-shirt from The Midday 180 when he threw the fish, and the radio station admitted to knowing about the stunt, but said they had no part in planning it. Waddell was not arrested at the arena, but he was told he would face a charge of disorderly conduct, and that he was not welcome to visit the arena again. It wasn't until Tuesday that Waddell found out about the additional charges of possessing instruments of crime, and disrupting meetings and processions. Following the incident, Waddell received support from all across the city - Carrie Underwood, Metro Councilman Freddie O'Connell, and even the Tennessee Bureau of Investigation took to twitter in support. 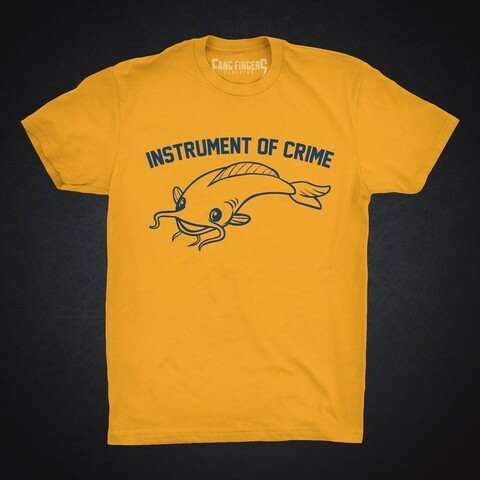 In an arrest summons from Pittsburgh Police Department, the catfish was described as an "instrument of crime." A local apparel company quickly made a t-shirt supporting the bold and humorous claim that the cat was an "instrument of crime." According to reports, Fang Fingers Clothing officials said they won't be printing this shirt. The concept was created by Blake Tucker with Everything TN. Waddell is said while he disagrees with some of the charges, he isn't taking them too seriously. "I've eaten a ton of fried catfish in my life, and never once have I thought I've eaten an instrument of crime," Waddell said. "It was absolutely, ten times over worth it, and I would do it 1,000 more times." Nashville Mayor Megan Barry's office released a statement about the catfish incident on Tuesday, saying: "Mayor Barry appreciates and applauds the enthusiasm of our fans. However, as Mayor she knows that it would be inappropriate for her to intercede in a criminal matter locally, let alone ask the Mayor of Pittsburgh to do the same. We would hope that in the spirit of good sportsmanship that any charges for throwing a catfish onto the ice would be quickly dismissed." On Monday, Pittsburgh seafood stores said they would refuse to sell catfish for cash and that they would check the zip codes of everyone who showed up to buy one. Although Nashville dominated possession and outshot Pittsburgh 26-12, the Preds fell 5-3. Whether catfish or cat, it's never acceptable to toss any sensitive, intelligent animal's body onto the ice during a hockey game. PETA appreciates PPG Paints Arena's swift action to eject the fan and have him charged with several crimes, which will remind all sports fans that this offensive behavior will not be tolerated. We trust that all NHL arenas will follow suit. PETA's motto reads, in part, that "animals are not ours to use for entertainment," and PETA's letter thanking the Pittsburgh Penguins for the arena's swift action on Monday is available here. Please let me know if you have any questions or if there's any further information that I can provide.